Sometimes lost in all the success of TaylorMade-adidas Golf Company’s metal woods business is the fact that it makes some of the better wedges on the market. So with that in mind, I give you the new TaylorMade Tour Preferred wedges from renowned club designer Clay Long. Long was at one time the leading designer for MacGregor Golf (in its heyday) and designed the putter that Jack Nicklaus used to win the 1986 Masters. The first sole option, Bystedt said, is a new Classic Grind for the player who prefers a clean, classically designed wedge with a very traditional shape. This model is offered in lofts of 50, 52, 54, 56, 58 and 60 degrees with several bounce options. The heel relief allows for the versatility of a C-grind on open-faced shots, according to Bystedt, but retains the main sole surface for better performance on full swings and shots from the bunker. he second option is a refined ATV Grind, inspired by TMaG’s opular All Terrain Versatility design. The new ATV Grind boasts a reshaped sole that’s slightly arrower, Bystedt said, which allows better performance on open-faced shots and on tight lies. The ATV Grind promotes less bounce on full shots, chip shots and out of the sand, while maintaining higher bounce on open-face shots that are crucial around the green. The ATV grind will be available in lofts of 54, 56, 58 and 60. 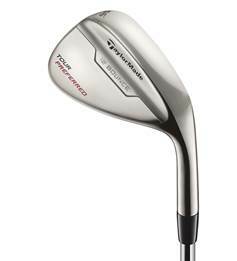 The Tour Preferred wedges, Bystedt said, also each feature an optimized Micro Texture face that helps enhance ball speed and greenside control in addition to the most aggressive groove design TaylorMade has ever created to promote more spin and greenside control. The KBS Tour V is The Classic Grind will be available at retail April 18 and the ATV Grind will hit stores on June 15.